God accepts you ONLY as you are because of Jesus. Rest and live in that confidence. Shel Silverstein tells a narrative of pure love and the model of Jesus in a short story about a tree and a boy in ‘The Giving Tree’. The boy and the tree grow together, with the tree sacrificing part of itself to serve and care for the boy in each phase of life. From providing a snack in the form of an apple, shade from the summer sun, lumber to explore the world and live an adventure, to finally having only a stump the now elderly man could sit and rest upon, the tree consistently lays itself down in the best interest of the boy. The boy consumes every provision the tree offers, growing from the nurturance, accepting the pieces of the tree to construct a vessel for his adventure, then resting on all the tree has left to give. The lesson in this story is bilateral. The perspective we bring from our season of life and personal experience determine how we will apply the morals. On one side, the tree is enabling the boy. It is giving, giving, and giving again until there is nothing left of itself. When we spend all of our time focused on emptying ourselves into others, we risk becoming a shell of a person. You cannot pour from an empty cup, we must take time to be refilled and maintain relationships which are mutually investing. From the opposite side, the tree represents Christ. In the time Jesus spent walking the earth, He was growing with us. Physically growing, and exemplifying emotional and spiritual growth to ultimately bring us closer to God. He gave until there was nothing physical left He could provide. Broken, disabled, mangled and physically dead, all that remained was a place to sit quietly and rest. And still, He provided. Who are you? The boy who consumes? The giver who enables and invites themselves into a situation of unilateral love and is left empty? Or the grown man who now sees all the sacrifice the tree has made to provide for you, even if your appreciation is long overdue? At first glance, it seems today’s theme is contradicting the last post. Bear with me and we’ll hash out what’s going on. In the fourth drawing from the City on a Hill series, we discussed the allegories of salt and light Jesus highlighted in chapter 5. The quick summary of his point there is to live out your faith, actively serving and giving to anyone in need. Jesus explicitly states, “let your light shine before others, so that they may see you good works and give glory to your Father who is in heaven.” (Matthew 5:16) Just a few paragraphs later, we find this, “Beware of practicing your righteousness before other people in order to be seen by them, for the you will have no reward from your Father who is in heaven.” (Matthew 6:1) So which is it, Jesus? Do good works in front of people or not? Reading prescriptively would inspire just such a question. To understand what Jesus is really teaching, we must change our perspective to an outsider viewing the crowd he is addressing instead of inserting ourselves as being the sole representative of the crowd. In Matthew 5, Jesus is speaking to the working-class citizens who are listening. He is addressing the poor, entreating them to love and serve each other by giving of their time and money. He encourages them to do so visibly as a motivator for their fellow citizens to follow suit. In the first verses of chapter 6, the focus of his words are aimed at the rich and religious elite who, up to this point, have undoubtedly been cheering Jesus on! He says to them, don’t let pride be your motivator for serving. Everyone knows you have money and power, don’t flaunt it using philanthropy. Pride is not honorable in God’s eyes. This made me consider the whole Occupy Wall Street movement, and all the sub-movements that stemmed from the media hype. The motivations, methods, and attitudes of both Wall Street and the Occupiers rank high on my cynical radar. I imagine Jesus delivering the Sermon on the Mount from a bench in Central Park, Occupy members mixed with some of the homeless community would be crowding up, front and center. Wall Street, NYPD on horseback, and many political leaders would line the outer skirts of the audience to enforce crowd control, but also within earshot of the profound words being spoken. With what little first-hand knowledge I have of either group, my media-driven understanding of the occupiers is freeing America’s poor from the corrupt, oppressive thumb of America’s elite. The elite are just out to make a buck, and the media only portrays the dark side of corrupt business, presenting it as the gold standard of all business. I filter all forms of media through a healthy screen of skepticism, no matter which side they seem to support, so I am convinced neither of the descriptions above are accurate. If they were, however, Wall Street would be like the Pharisee, guilty of flaunting their philanthropy to generate more prestige and likely convert that into new business opportunities. The occupiers would be just as guilty of ignoring the needs of those around them and spending too much time calling for Wall Street to be more public with their giving! To sum all this up in today’s drawing, I have used the bottom half of the Guy Fawkes mask (at least a quick version of it) to represent the an abbreviated message of the Occupy movement; give. Extending from the bottom of the page is a hand with a single raised finger. 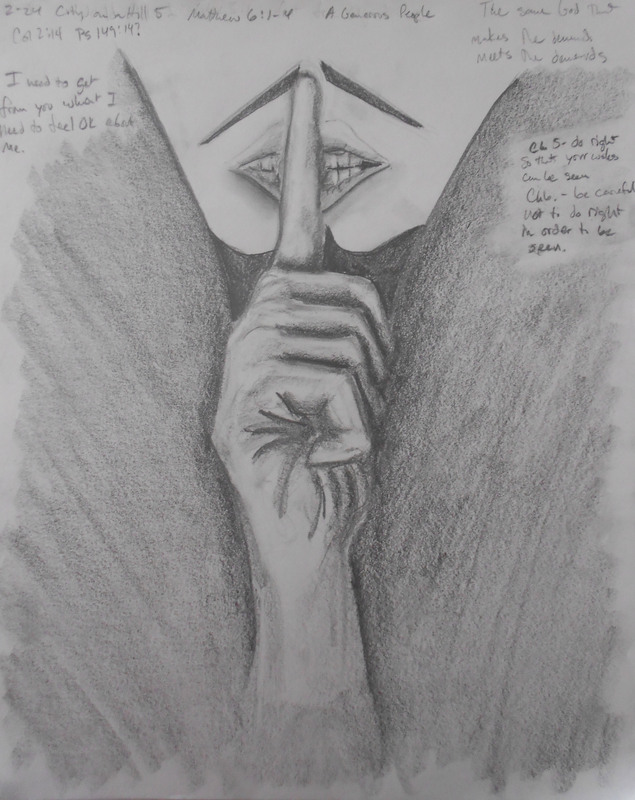 The finger covers the lips of Guy Fawkes, positioned so that you hear a quiet whisper of “shhh” in the back of your mind. The message I will apply yo myself from today is this; occupy yourself, selflessly giving to anyone in need, but do it quietly so that pride does not become your motivator.